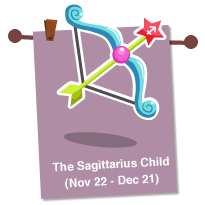 If your baby gets into all kinds of trouble before he/she can even walk, don’t be surprised for a Sagittarius child is born adventurer. Independent and free-spirited, it’s imperative that the Sagittarius Baby has lots of room to roam as he/she simply loves to explore. This baby needs freedom, has a curious mind, and is forever on a journey of discovery. Stimulate your little Sagittarius’ mind with books from a young age. As your child gets older, include family vacations, outdoor adventures, and trips to the museums, zoos and art galleries as part of the learning experience.